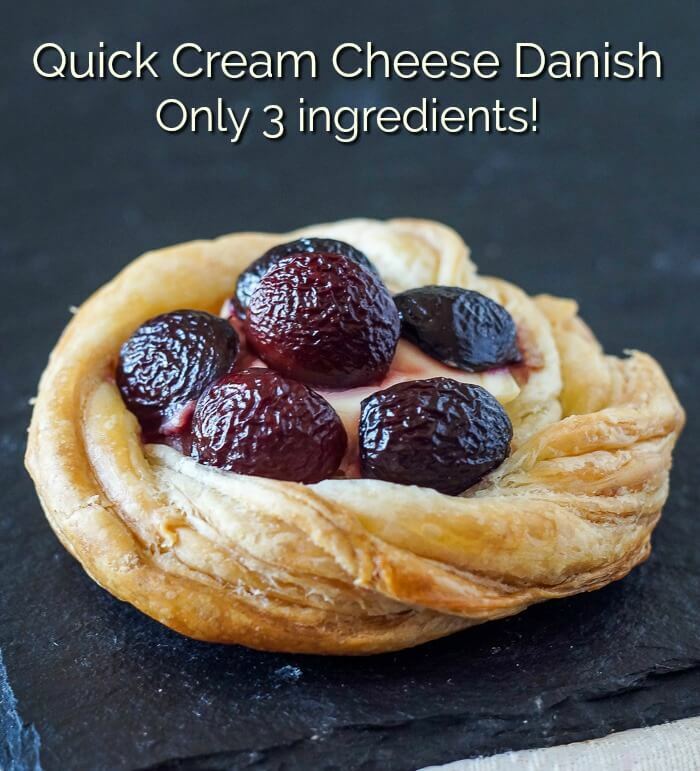 Quick Cream Cheese Danish - only 3 ingredients! Ready in no time! Quick Cream Cheese Danish. Only 3 ingredients! 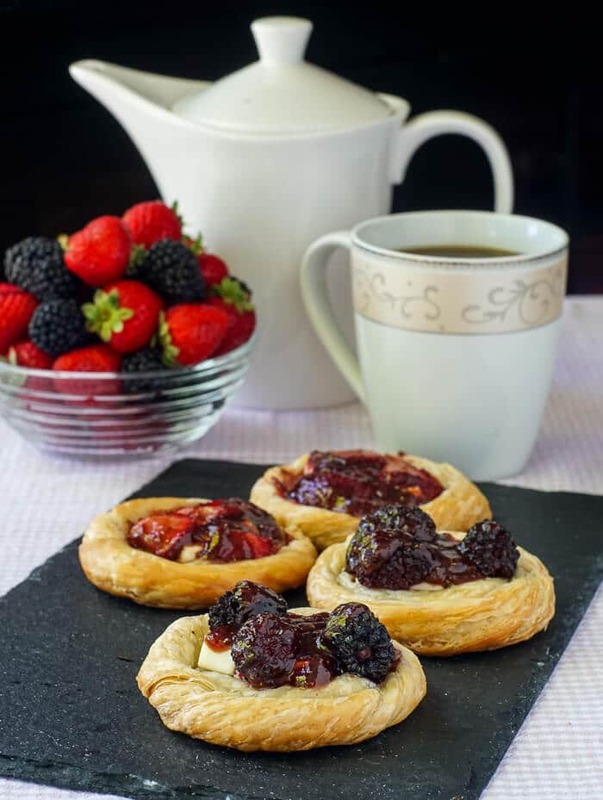 Use whatever fruits and berries you like to make these gorgeous little pastries. 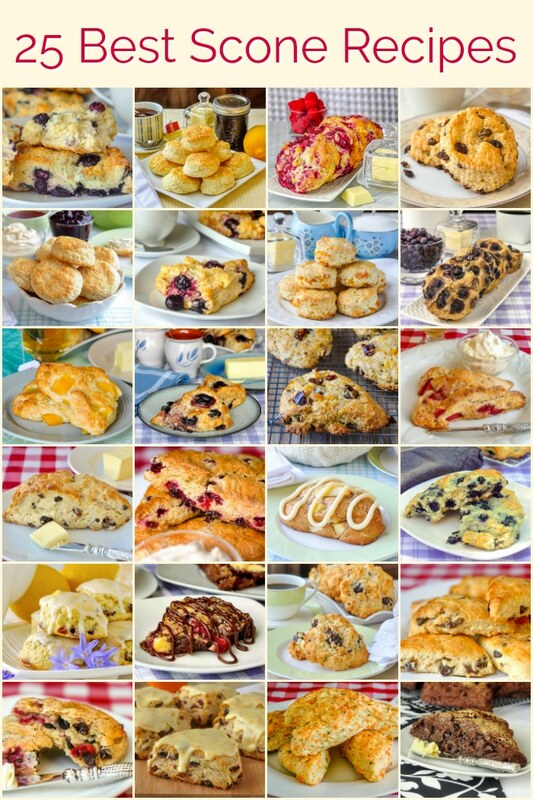 Theres no doubt about it, I love a good breakfast pastry. Whether it’s great croissants from our local Georgestown Bakery, a pain au chocolat or a fruit danish, I am a major fan of baked carbs for breakfast. At good hotel breakfast buffets I have been known only to have the pastries for breakfast. I can’t resist. Sometimes it feels good being a little naughty to start your day. While not an everyday thing, breakfast pastries are a real special treat that everyone should be able to enjoy guilt-free every now and again. I particularly like to serve them at brunch when entertaining family and friends. For some folks, it’s pretty easy to pop by your local bakery and pick out a selection of fresh baked pastries. When you are serving a larger group, however , this can get quite pricey. 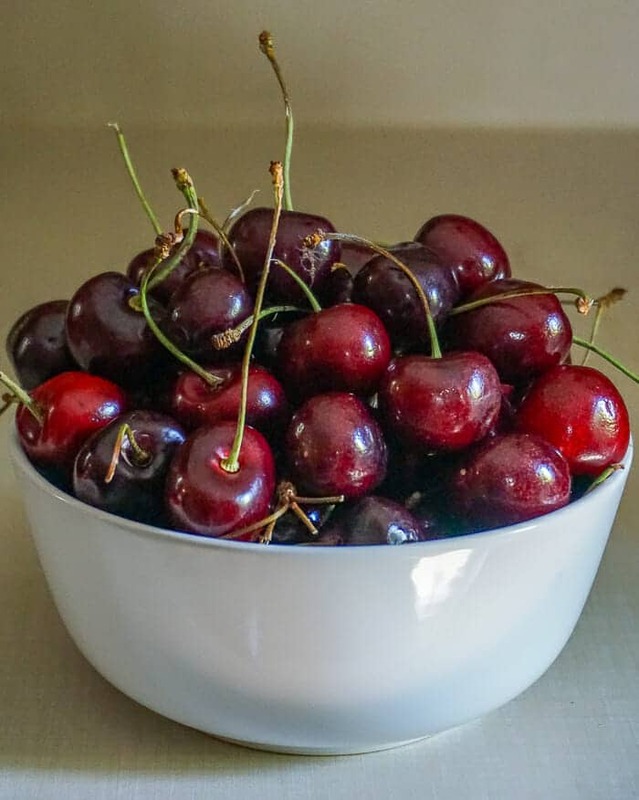 Fresh Cherries are one of my favourites for this recipe. 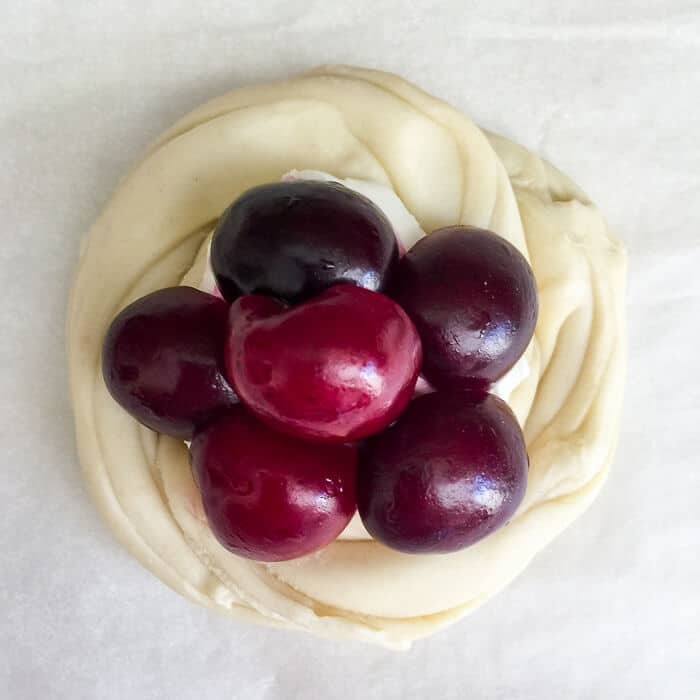 My 3 ingredient solution will make 12 buttery, flakey, fruit and cream cheese danish in no time and for just a few dollars to boot. When I have the time, I like to make my own danish pastry, which is a yeast raised dough that can take a couple of hours to make. Many times, I take the quick shortcut of using frozen, all-butter, puff pastry sheets instead. 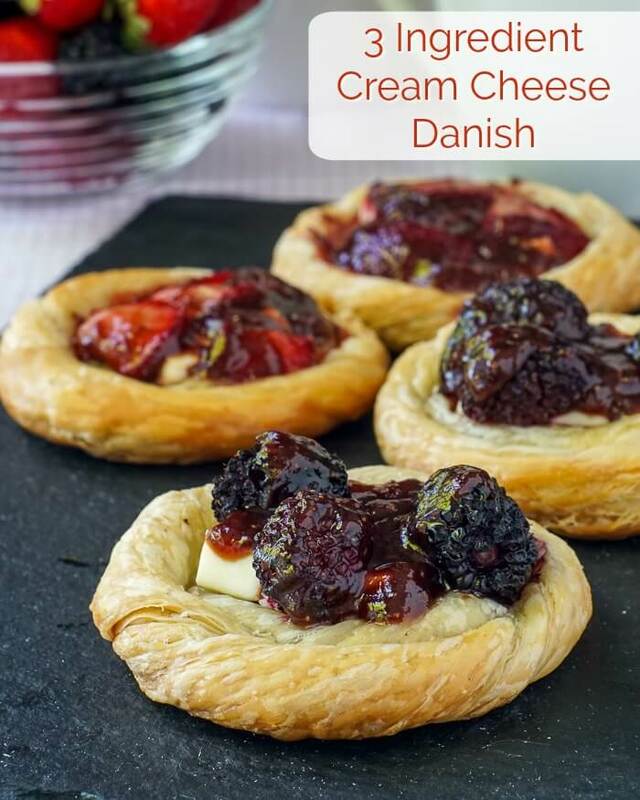 I have always loved cream cheese at the centre of a danish too; it’s such a great combination to bite into the sweet fruit, creamy cheese and buttery pastry. Every bite is just scrumptious! 3 ingredient Cream Cheese Danish- so quick and easy to make. Many times, I prepare these quick cream cheese danish the night before and wrap the baking sheet in plastic wrap overnight. Since puff pastry is always best going from a very cold state to a hot preheated oven, this make-ahead method may even be the best way to make them. The next morning, these beautiful pastries can then be popped into the oven while your coffee is brewing. What could be easier!? This is a terrific easy recipe for all summer long, especially as different fruits and berries come into season. Strawberries, raspberries, blackberries, blueberries plus thinly sliced peaches, plums or nectarines can be used. Of course in winter, frozen berries or fruits will do just fine too. I prefer to thaw them first, in that case. Cream Cheese and Lemon Curd danish is also a real favourite of mine. Like this Quick Cream Cheese Danish recipe? Quick Cream Cheese Danish - only 3 ingredients! 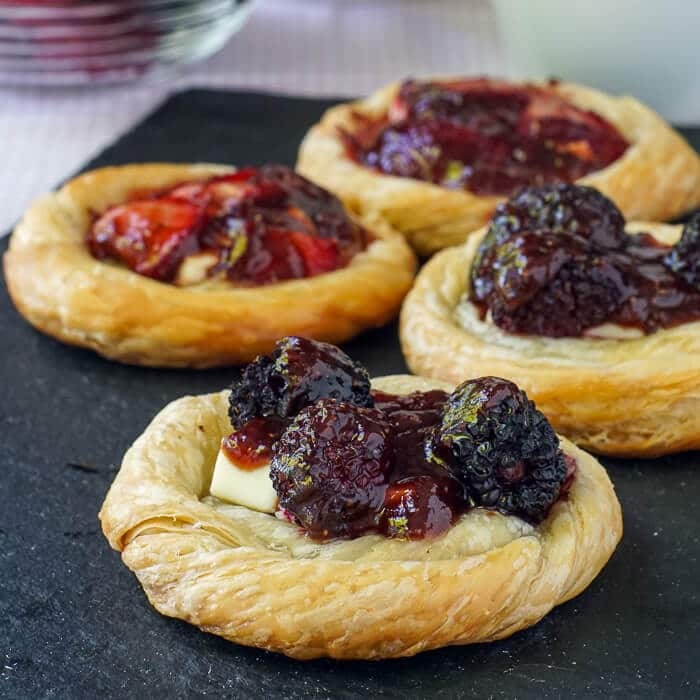 Use whatever fruits and berries you like to make these gorgeous little pastries. The frozen puff pastry I buy comes on 12 inch square sheets, with two to a pack. If yours is another size you will need to roll them out to approximate that size. Work with the pastry when it is very cold, straight from the fridge, where it should be put to thaw coming out of the freezer. If you thaw the pastry at room temperature, you are going to have to chill it in the fridge for an hour to use it. Cut the 12 inch squares of pastry into 8 equal strips each. For each danish, twist together two strips into a skinny log shape. Lay the twisted pastry on a lightly floured surface. Using the palm of your hand, roll about 1/3 of the length of pastry out to about half the thickness of the other two thirds, while still keeping the dough all in one long piece. Starting at the thinner end, wrap the pastry around in a circle to create a round flat disk. Tuck the end of the pastry underneath and press down gently in that spot. Place on a parchment paper lined baking sheet. Repeat for the next 7 pastries. The skinny end of the pastry should form a slight depression/hollow at the centre. The purpose of this is to keep the pastry from getting doughy and undercooked at the centre. It also provides a place to put the cream cheese and fruit. Cut the 6 ounces of cream cheese into 8 equal pieces and add one piece to the centre of each danish. Top the cream cheese with several slices of fruit, or berries. Chill the danish for at least 20-30 minutes before baking. Bake in a preheated 400 degree oven for 15-20 minutes until golden brown with a firm bottom. (Optional) When the pastries come out of the oven, you can brush them with a little jam that's been warmed in the microwave. Here, I've used a little of our roasted strawberry jam on the blackberry and strawberry versions. Apricot jam is a traditional glaze for many danish recipes. Cool on a wire rack fro 10-15 minutes before serving. Barry,Don’t you mean to cut the pastry into 16 strips-instructions state to twist two strips of pastry together to make 1 danish. 16 strips=8 pastries.Please clarify.Thanks OOPS..Now I see that you have 2 sheets of pastry.My mistake! Love your recipes but I find this one a bit confusing. In the above, do you not mean to say “Repeat for the next 7 pastries.” and Cut the block of cream cheese into 8 equal pieces and add one piece to the centre of each danish” as there will only be 8 pastries, not 12. Also, you don’t add any sugar to the cream cheese. Is this correct??? I’d like to make these for Easter brunch so would appreciate an early reply. Thank you so much. I’ve updated the recipe to correct the numbers. It happened when I was scaling down the recipe and forgot to save my changes. You can beat a little sugar into the cream cheese if you choose. I just like them without it because that’s the way I had them at a bakery. I love both cream cheese and lemon curd — do you blend the two, or is an either/or choice? Also would love to see a video if at all possible. No, the cream cheese is usually under the curd in the recipes I’ve seen.